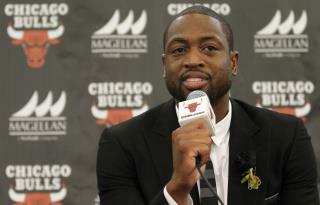 (Newser) – Chicago police say two brothers have been charged with first-degree murder in the shooting death of the cousin of NBA star Dwyane Wade as she was walking to register her children for school. Authorities say 26-year-old Darwin Sorrells Jr. and 22-year-old Derren Sorrells were charged Sunday in the death of Nykea Aldridge, reports the AP. Police say both brothers have criminal records and were on parole at the time of the shooting, reports NBC News. The 32-year-old mother of four was pushing a baby in a stroller near the school when two men walked up and fired shots at a third man but hit Aldridge in the head and arm. Police say she wasn't the intended target. Colin... gosh I am so glad your sit down protest is about rampant crime and who is committing it... those whites are so oppressive... whisper.. whisper.. oh wait whats that you say... these murderers were black? well shucks... guess that is the white folks fault too... if they weren't so oppressive blacks would not go killing each other... right? "2 brothers" You got that right.